Over the past nine months, two factions within the Chinese Communist Party have held one another in a death grip, with neither side able to finish the other off. As they have careened from one crisis to another, desperation has given one side an advantage, turning the fear the CCP may shatter into a share of power. The string of crises began when Chongqing’s former police chief, Wang Lijun, fled for his life on Feb. 6 to the U.S. Consulate in Chengdu, in southwestern China. When Wang left the consulate, he was escorted by high-ranking officials to Beijing for interrogation. There Wang told Party officials of how his former boss, Chongqing Party head Bo Xilai, working with the Chinese regime’s then domestic security czar Zhou Yongkang and others, planned to stage a coup after the once-in-a-decade leadership change at the 18th Party Congress. This revelation gave then-Party head Hu Jintao the ammunition he needed to settle scores within the Party. For the 10 years Hu held the top post, he had been locked in a struggle for dominance within the Party. On one side was the faction formed by former Party head Jiang Zemin, including Bo Xilai, Zhou Yongkang, former propaganda minister Li Changchun, and Jiang’s reliable fixer and advisor, Zeng Qinghong. On the other side are Hu Jintao; Premier Wen Jiabao; Hu’s successor, Xi Jinping; Wen Jiabao’s successor, Li Keqiang; and those loyal to them. The planned coup attempt was a desperate effort by Jiang Zemin and his faction to keep their hold on power. Since Jiang retired in 2003, his faction has fought and schemed to remain in control so that they can avoid being held accountable for crimes committed in the persecution of Falun Gong, a popular spiritual practice. In 1999, Jiang ordered—over the objections of the rest of the then-Politburo Standing Committee—a campaign to eradicate Falun Gong. Bo Xilai, Zhou Yongkang, and other faction members took the lead in carrying out this campaign, which has been a war waged against an estimated 70 million to 100 million Chinese. Millions of Chinese have been detained, tortured, and subjected to brainwashing. The Falun Dafa Information Center can confirm over 3,500 Falun Gong practitioners killed from the abuse, but with accurate information difficult to get out of China, the Center suspects the actual number is several times that. Many more have been gravely injured. According to the research done by former Canadian Secretary of State (Asia-Pacific) David Kilgour and Canadian human rights lawyer David Matas, in the years 2000–2005, practitioners were the most likely source for organs for 41,500 transplantations. According to Matas, each year since 2005, an estimated 8,000 practitioners have been murdered through organ harvesting. If Matas’s estimates are correct, the total number of Falun Gong practitioners murdered now approaches 100,000. In addition, a generation of orphans has been created, families across China have been broken, and careers and livelihoods have been destroyed. Jiang’s faction faces this scenario: If it loses power, then the persecution of Falun Gong may be ended. Once the persecution is ended, the cry within China for holding those responsible for the crimes against humanity will be overwhelming. Eventually, Jiang and the others will be called to account. 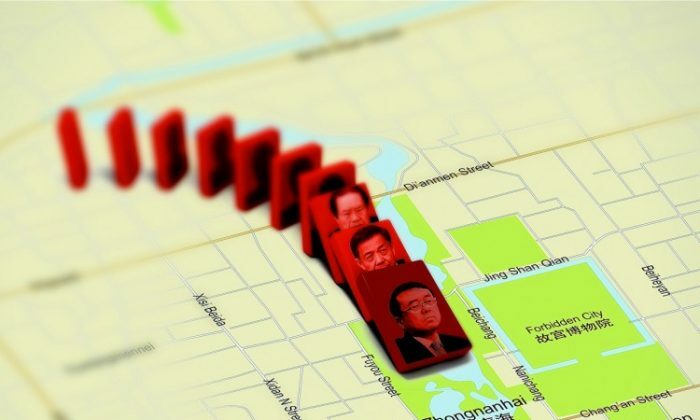 Hu Jintao and Wen Jiabao began to use the information provided by Wang Lijun as grounds for dismantling Jiang’s faction. In a busy spring, among other moves, Hu removed Bo Xilai as head of the Chongqing Party Committee on March 15 and then placed him under investigation. He removed Bo from the Politburo on April 10, put Zhou Yongkang under internal control, and removed those loyal to him from the powerful Political and Legal Affairs Committee (PLAC)—the Party organ that controls nearly all aspects of law enforcement in China. Hu shuffled top-ranking military officers, putting those loyal to himself in key posts. It looked as though Hu Jintao was ready to arrest Zhou Yongkang, a move that alarmed the powerful Ye brothers. Ye Xuanping and Ye Xuanning are the sons of Field Marshall Ye Jianying, one of the founders of the CCP, and each brother is powerful in his own right. Ye Xuanning used to head the Liaison Department of the PLA’s General Political Department, controlled China’s military spy system for a long time, and holds considerable influence in the military. Ye Xuanping was the former governor of Guangdong Province and the vice-chair of the Party’s main political advisory body. He is regarded as the spiritual leader of the princelings—the children of the founding generation of the Party. The Ye family’s major concern was that if Zhou were taken down, the CCP would crumble. Hu Jintao, on his part, had also realized that Bo Xilai’s crimes involved too many Party officials. If all of the guilty were prosecuted, the Party would be pulled apart. Hu decided to deal with Zhou in another way. In early May this year, 200 senior CCP officials attended a meeting held at the Jingxi Hotel in Beijing. According to a source familiar with the meeting, Hu set the following guidelines: Zhou must totally retire. After handing over power, he’ll also lose the power of appointing his successor to the PLAC. Zhou would be allowed to cut ties from Bo’s case and would be allowed to stay in office until after the 18th Party Congress. In the meantime, Zhou could still keep a high profile in public, creating an appearance of harmony in order to ensure a smooth transition of power. An agreement was also reached that included the hardliners, led by Zhou Yongkang and propaganda minister Li Changchun, to agree to Wen Jiabao’s proposals for political reform. Although the agreed reforms were to be very limited, they were to include what were described as “high-level free elections.” Guangdong Province was to take the lead with a pilot program. The Jingxi agreement appeared to be a peace treaty between the factions. In fact, the leaders of the Jiang faction could not face losing power. They met frequently, discussed matters, and bided their time. With the revival of the controversy over the Diaoyu Islands (called Senkaku Islands by Japan), the faction saw its chance. Working through Hong Kong’s new chief executive Leung Chung-ying and the United Front Work Department, Hong Kong fishing boats were arranged to carry Chinese nationalists to the islands. On Aug. 15, they landed carrying Chinese flags and declared the rocks Chinese territory. The cities of China erupted with mass anti-Japan protests and calls for war. The Jiang faction wanted to use the protests to pressure Hu Jintao and Xi Jinping. By bringing China to the brink of war with Japan, the faction could then urge wartime preparations, which would include instituting martial law. The 18th Party Congress—not yet scheduled—and the installation of new leadership would have to be delayed. Zhou Yongkang and others could remain in power for an extended period of time. The protests had an effect. Xi Jinping could see clearly that if events were allowed to continue as they were going, he and those loyal to him would be criticized inside and outside of the CCP. Having no way to retreat, Hu Jintao and Xi Jinping came together to attack and did so in a series of moves at the end of August and the beginning of September, including replacing the head of the United Front Work Department and embarrassing Hong Kong’s Leung by preventing him from attending the APEC meeting held in September. Around this same time, though, Xi Jinping shocked those present by saying that he did not to want take on the role of paramount leader, for which he had been groomed. But the reluctant Xi was indispensable. He had originally been chosen because the two factions could agree on him. There was no one to replace him, and if Xi did step down, both factions thought the CCP would immediately collapse. With Party elders taking the lead, a new consensus was reached: A date was settled for the 18th Party Congress, which would convene on Nov. 8; Bo Xilai’s political life was over; and the Party would systematically eliminate the residual influences of the Great Cultural Revolution and gradually discard Mao Zedong Thought, Marxism-Leninism, and so on. The consensus following Xi’s brief withdrawal replaced the consensus reached at the Jingxi Hotel. The consensus reached after Xi’s withdrawal solved nothing, with Jiang’s faction still fearing the leadership transfer that would come at the 18th Party Congress. News reports appeared in June in Bloomberg and in October in the New York Times claiming to document the wealth of the families of Xi Jinping and Wen Jiabao, respectively. All of the CCP leadership rightly fears the exposure of the tremendous fortunes the top leaders have accumulated. Most of China is still very poor, and the Chinese people hate how the CCP elite have enriched themselves on the backs of the people. Zhou Yongkang let it be known that the next step would be publishing similar information about the wealth of Hu Jintao, Li Keqiang, and others. This would have amounted to pulling the building of the CCP down around all of their heads. The blackmail worked. In order to preserve the Party, Hu Jintao felt he had no choice but to cut a deal. At the 18th Party Congress, to the surprise of many, the new members of the Politburo Standing Committee tilted decisively toward Jiang’s faction. Meanwhile, power in the military remained in the hands of those loyal to Hu Jintao and Xi Jinping. This balance of power will do nothing to stop the struggle at the Party’s highest levels. The military power controlled by Hu and Xi’s faction will unavoidably clash with the power of the Politburo Standing Committee. The members of Jiang’s faction will not be satisfied with their portion of power and will demand more, still seeking safety. One may predict that the recent fighting will not only continue, but also become more severe. Hu’s deal also does nothing to address the CCP’s fundamental problems: its countless crimes and the endless false information and hidden secrets. In October, the Party leaders quaked in their boots over a report detailing the wealth of Wen Jiabao’s family. Next may come information about the fake economic data the Party uses to prop itself up. Or the public may learn the true extent of the persecution of Falun Gong. Or the information about the mass atrocities committed through forced, live organ harvesting may come out. Hu pulled back from a political victory to save the Party, but he only succeeded in holding the ongoing crisis at arm’s length long enough for him to slip into retirement. His efforts to extend the CCP’s life have been futile.